What a joy it is to see a talented and creative filmmaker you really want to like live up to his promise, said promise culminating in a sequel that far surpasses its sire. 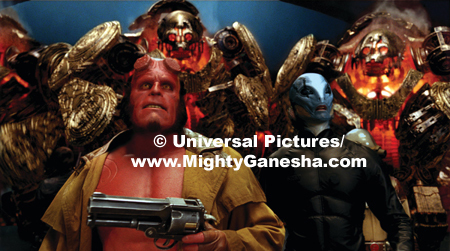 Guillermo Del Toro’s Hellboy 2: The Golden Army is the fun, fantastic comic book ride that the original never quite lived up to. 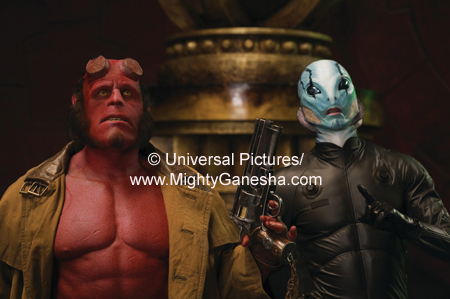 Picking up where its predecessor left off, Hellboy 2 finds our heroic collection of monsters and mutants still fighting on the side of right, while the super secret government agency that is home for the assorted champions wages its own battle against the tide of publicity. 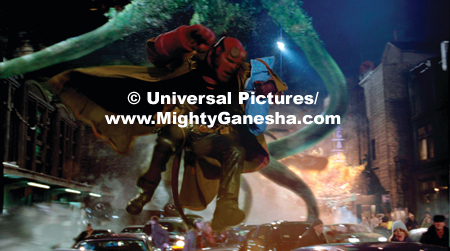 The public wants to know who these mysterious crusaders are and Hellboy’s take no prisoners style of combat doesn’t exactly lend itself to concealment. 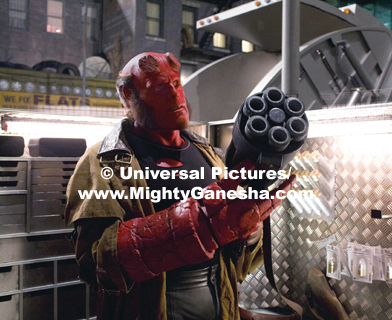 For those who neither caught the first film nor read Mike Mignola’s source comic books, Hellboy is the son of Satan. Really. 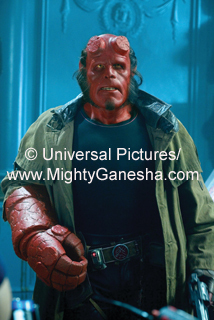 Discovered living in a Nazi lab in Germany at the end of WWII by Allied scientists, the red, tail-sporting, behorned infant grew up under the care of Dr. Broom in the depths of a New Jersey bunker, where he was trained to hone his superhuman strength for the good of mankind. 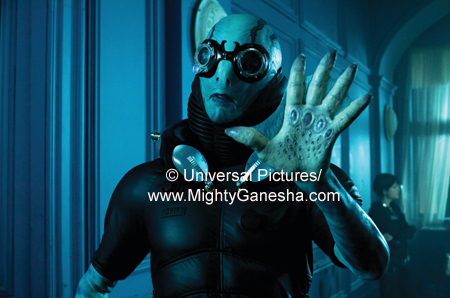 Hellboy’s pal, Abe Sapien, a humanoid sea creature and empath, was also nurtured under the umbrella of the good Dr. Broom (Broom was murdered by enemies in the previous chapter). 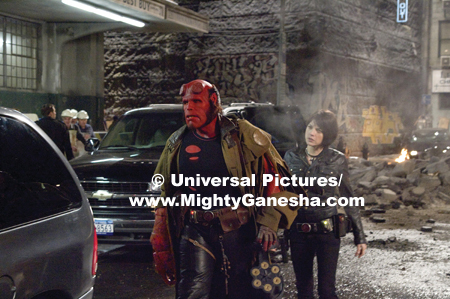 The third in the supernatural troika is Liz Sherman, firestarter extraordinaire and also Hellboy’s honey. 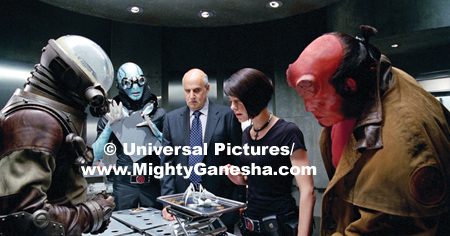 In Hellboy 2, Liz and Hellboy have moved in together in and much of the film is spent watching the two bicker through their growing pains as a couple. 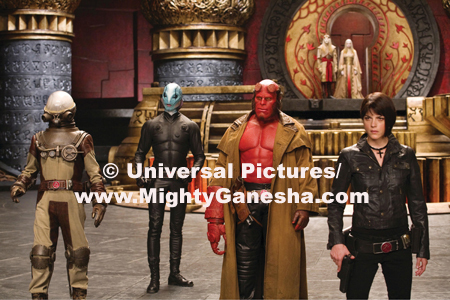 Hellboy 2 doesn’t begin with our three heroes; it starts much further back when gods and monsters roamed the earth. In a fit of disgust with the human race poised to demolish the entire natural world he protects, the Elven king, Balor unleashed an indestructible army to wipe the destructive humans off the face of the earth. Rueful of the automatons’ mass murder, King Balor creates a pact between men and the Elves that the Golden Army would never again be released as long as humans pledged to respect and honour the earth. 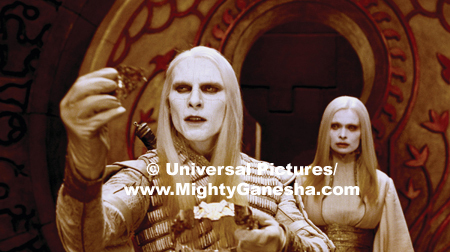 This treaty went down not at all well with Balor’s son, Prince Nuada, who sets off in exile until he has seen enough of the backsliding humans’ disregard for his father’s pact and returns to save his people and their world from further destruction at men’s hands. 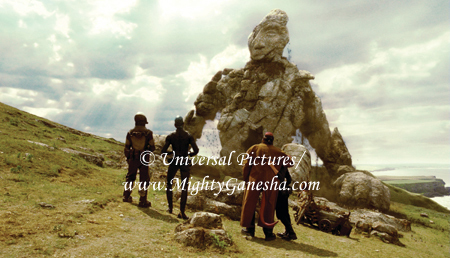 His determination to set the Golden Army on mankind once again is where our little troop of good guys comes in. 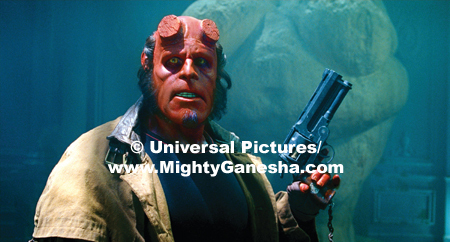 I didn’t care much for the first Hellboy film. I found it monotonous and kinda dull. 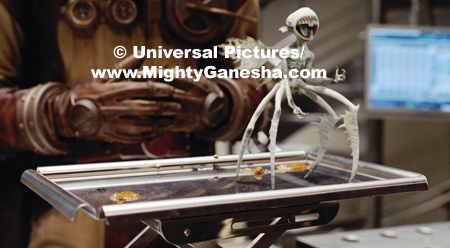 The pacing dragged and I hated that the main big bad was just the same gray, tentacled creature over and over again. I just didn’t care. 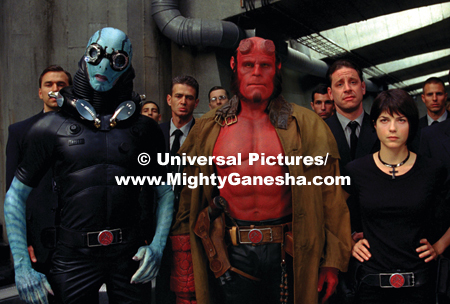 It smacked too much of comic book / sci-fi fanboy geekdom, and while I’ve never had a problem with that, it was just too exclusive a club this time and I felt only those who were already Hellboy fans could really appreciate the 2004 film. 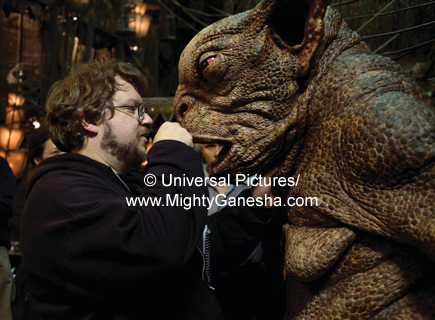 This time, it seems that Guillermo Del Toro’s adventures making the very serious, very dark Pan’s Labyrinth have taught him an armload about timing and a tight, captivating script. 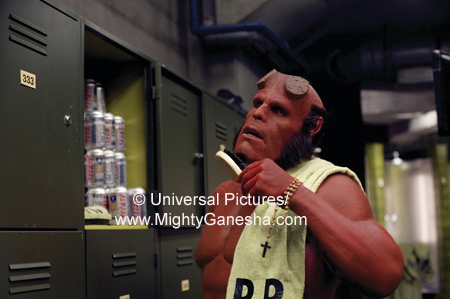 Hellboy 2 is vastly entertaining on every level; the humour crackling throughout the film is droll enough for the grownups and broad enough for the kids; Hellboy and Abe drowning their romantic sorrows in Tecate to the smooth stylings of Barry Manilow will pay for your ticket. 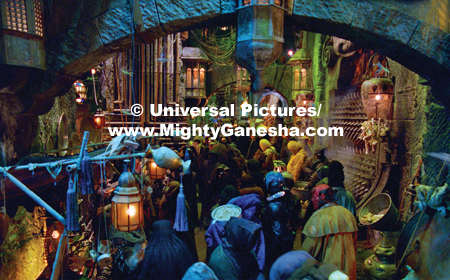 The Elven mythology of the plotline is actually relevant for these Go-Green times and current with the Lord of the Rings lore still fresh in audiences’ minds. 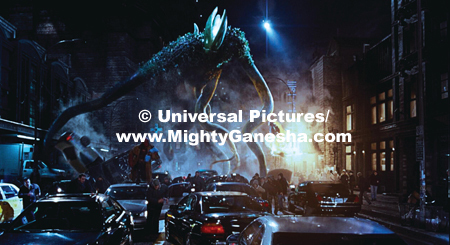 Best of all was the movie’s complete saturation into the extraordinary, phantasmagoric world constructed by self-proclaimed geek and fanboy guru Del Toro. 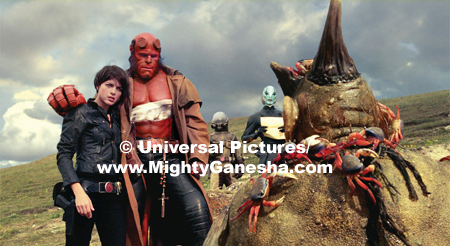 Where I didn’t see enough of a variety of interesting creatures in the original, Hellboy 2 won’t let you throw a rock without hitting a monster (- that will probably rip your arm off and beat you with it). 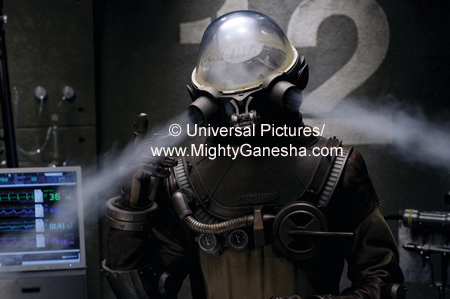 The creations on display are a mix of CGI, the ever-trusty rubber suited humans and sometimes a wonderful, fantastic combination of the two. 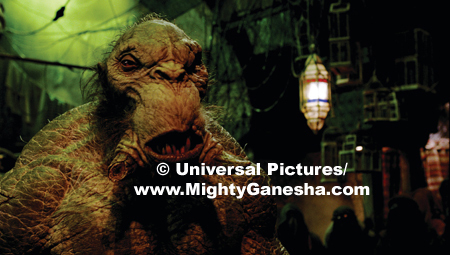 As eye popping as the Star Wars cantina, the Troll Market sequence allows Del Toro to pile on the creatures for your delectation. 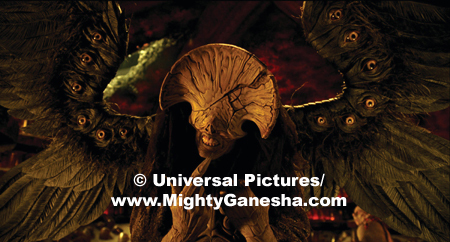 The Pan’s Labyrinth-like Angel of Death, who sees all before our heroes is terrifying and hauntingly beautiful. 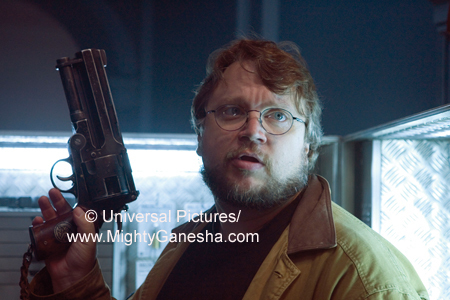 There seems to be no rein on Del Toro’s imagination in this film and the director revels in it without being excessive or pointless, but is clearly having as great a time showing off as his audience will watching. 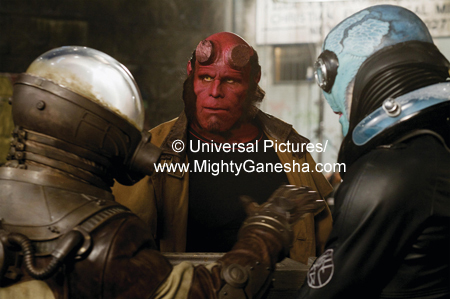 How does one go wrong with Ron Perlman in anything, really? So adored by the filmgoing public is this perennial character favourite that nary a comic book fan uttered a peep when he was originally cast as the benevolent son of Satan. 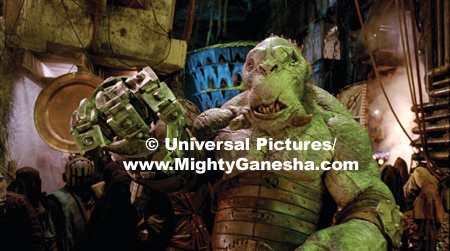 His performance was the only thing I couldn’t fault with that first film. He surpasses himself in this newest chapter as the crabby, cantankerous, stogie-chomping, cat-loving anti-hero who is now forced to be a responsible adult since setting up house with Liz. Perlman’s wiseacre line deliveries never wink at the audience and have the same tone and resonance as a Humphrey Bogart or George Raft in their 1930’s gangster heyday. Particularly funny are his spars against the new leader of the hero group, the Germanic ectoplasmic authoritarian, Johann Kraus. Selma Blair has more to do this time as Liz, the depressive pyrokinetic. 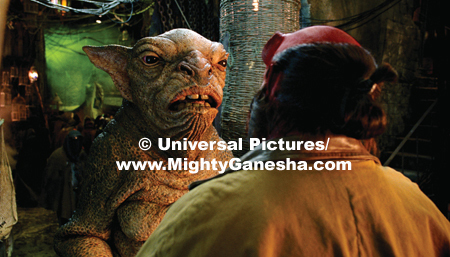 Moving in with “Big Red” gives her a much more interesting set of issues than the annoying whingeing and navel-gazing of the first film, but there’s still something off about her performance, a lethargy that makes me want to stick a pin in her. 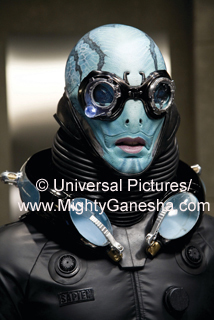 Doug Jones fully fleshes out the amphibious Abe Sapien in voice as well as body this go round, just in time for the sensitive detective in love with the twin sister of the vengeful Nuada, the gentle Princess Nuala. 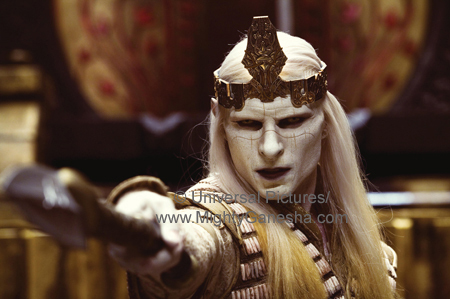 Luke Goss is an exciting addition as the trio’s nemesis, Prince Nuada. Goss commits to the fallen prince, investing his lines with authority and offended regency, and his grievance is actually valid. 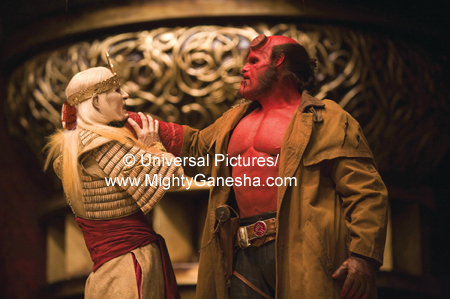 Goss also gives Hellboy 2 some great martial arts action; the actor clearly took his physical training seriously and the many scenes of him fighting with sword or staff nicely jolts the film’s energy. 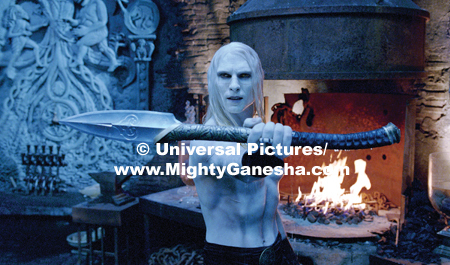 Nuada’s clash against Hellboy is gripping and fun to watch. Good stuff, this; entertaining, exciting and a load of popcorn-grabbing fun. 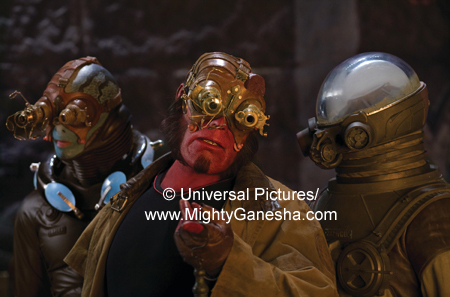 I’m so pleased at what a blast Hellboy 2: The Golden Army was that I’ll be looking forward to “Hellboy 3: Rise of the Little Red Babies” in a couple of years, as well.